The U.S. EPA has finalized the 2018 RFS RVO at 19.29 billion gallons of renewable fuel, including 288 million gallons of cellulosic biofuel, 2.1 billion gallons of biomass-based diesel, and 4.29 billion gallons of advanced biofuel. Ontario’s Ministry of the Environment and Climate Change has released a proposal to update the province’s Ethanol in Gasoline Regulation, increasing the blending mandate from 5 to 10 percent by 2020. On Dec. 1, Texas Gov. Greg Abbott sent a letter to U.S. EPA Administrator Scott Pruitt requesting a waiver of Renewable Fuel Standard blending requirements, claiming the program is negatively impacting the state’s economy and employment. On Nov. 30, the U.S. EPA published documents describing its interpretation of statutory requirements to conduct periodic reviews of certain aspects of the Renewable Fuel Standard and prior actions the agency has taken to fulfill its obligations. The U.S. EPA has released renewable identification number (RIN) data for October, announcing that nearly 1.68 billion RINs were generated during the month, including more than 19.23 million cellulosic RINs. Rex American Resources Corp. has released third quarter financial results, reporting that net sales and revenue reached $121.2 million, up 4.2 percent when compared to the $116.3 million reported for the same period of last year. Renewable Industries Canada has launched a public awareness campaign on the environmental and economic benefits of biofuels mandates. Dubbed "Facts Don’t Lie," the campaign is designed to educate the public on the benefits of biofuels. As drivers across the country hit the road during this busy holiday travel season, Growth Energy is launching a digital advertising campaign in E15 markets to educate drivers about the clean, high-performance fueling option that can save money. ICM Inc. has announced data from two studies shows the production of value-added animal nutrition solutions for protein production is achievable with ICM’s patented Fiber Separation Technology and patented Fiber Separation Technology Next Gen.
Edeniq Inc. recently announced that the U.S. EPA has approved Mid America Agri Products – Wheatland LLC’s registration to produce cellulosic ethanol at its ethanol production facility in Madrid, Nebraska, using Edeniq’s Pathway technology. 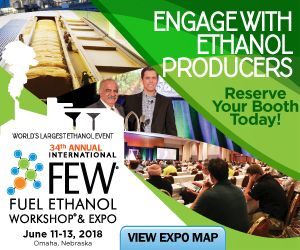 Ten years ago, Renewable Fuels Association member company Western New York Energy began production at its 62-million gallon per year ethanol plant in Medina, New York. Ecuador’s imports of U.S. DDGS increased 296 percent year-over-year to 22,200 metric tons in 2016/2017, the direct result of the U.S. Grains Council’s work to introduce the feed grains coproduct to the nation’s livestock sector. United Ethanol LLC is to install a Whitefox ICE membrane system at its plant in Milton, Wisconsin. The modular bolt-on system frees up capacity in the distillation-dehydration section, enabling the plant to increase its annual production capacity. The U.S. Department of Energy’s Bioenergy Technologies Office has established the Feedstock-Conversion Interface Consortium, a research and development consortium focused on biomass supply, preprocessing, and conversion technologies. Shipping containers containing 7,850 metric tons of U.S. DDGS arrived into the Port of Ho Chi Minh City, Vietnam, between Oct. 25 and Nov. 10. The shipments were among the first orders filled since the country lifted its suspension of DDGS imports. The Australian Renewable Energy Agency recently announced $11.9 million in funding for Australian biofuel company Ethanol Technologies Ltd. to complete the development and demonstration of its groundbreaking advanced biofuel technology. Leaders of the U.S. Grains Council and National Corn Growers Association recently traveled to South Korea and Mexico to engage with customers and officials during a period of policy uncertainty in the U.S. corn industry’s No. 1 and No. 3 markets. The Australian Renewable Energy Agency recently announced $4.03 million in funding for Australian yeast developer Microbiogen to make production of bioethanol from plant waste cheaper and more efficient. The deadline for submitting speaker abstracts for the 11th annual International Biomass Conference & Expo is end of day Dec. 1. The event is set to take place April 16-18 at the Cobb Conference Center in Atlanta, Georgia.